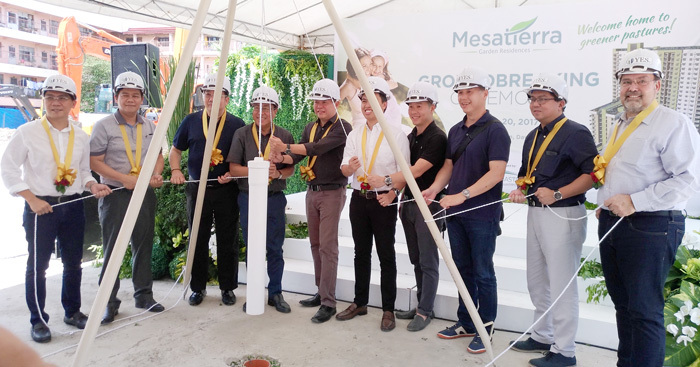 About seven months after its launch, Mesatierra Garden Residences, a 694-unit mid-market residential condominium, breaks ground and lays the time capsule on October 20, 2017 at its prime location along E. Jacinto Extension here in Davao City. 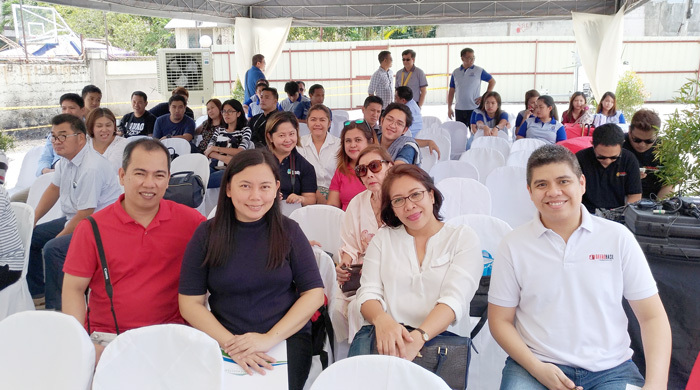 This is the first development project undertaken by Yuson Excellence Soberano, Inc. as a joint venture of Cebu Landmasters, Inc. and Davao-based Yuson Comm Investments. 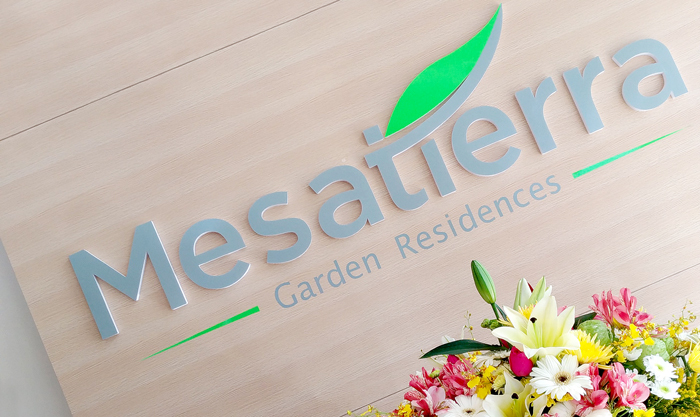 Mesatierra Garden Residences boosts a luxurious living experience centered on a relaxing and refreshing garden environment complete with modern amenities and facilities situated within the heart of the city. It’s a green paradise right at your doorstep and a contemporary haven you can unwind after a long and busy day. 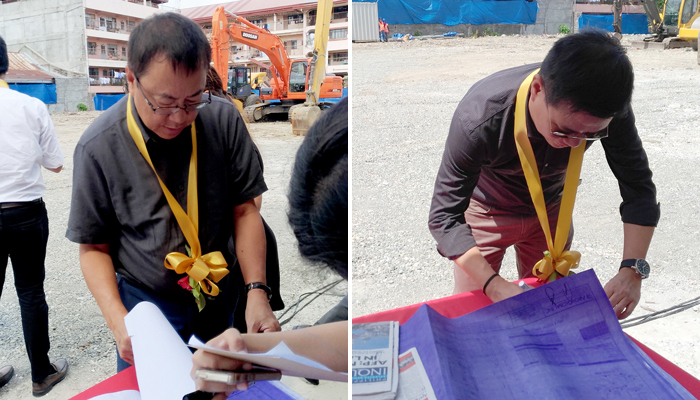 (L) Jose R. Soberano III, President and CEO, Cebu Landmasters, Inc.
sign plans and newspapers to be placed inside the time capsule. 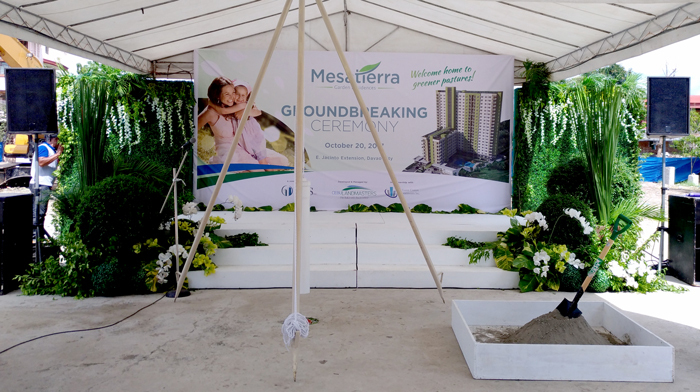 Present during the ground breaking ceremony were the executives and stakeholders of Mesatierra, Davao City government building officials, bloggers and media friends. “Slated for completion in 2010, MesaTierra creates a beautiful living experience with its well-designed residential units and 40% open space. We ensure our buyers of great value for their money with our generous features and amenities,” said Yuson Comm Investment Chief Executive Officer, Frederick Yuson. “We want this project to be a real and significant contribution to the community of Davao City. While we have people coming from our headquarters in Cebu here, we wanted to make sure that we retain the very Davaoeno culture of this particular project. That’s why the project manager is also from Davao. And there will be more people from Davao joining us, even our sales force we have to make sure that bulk of them will be coming from Davao City. Even the construction is awarded to a Davaoeno contractor. 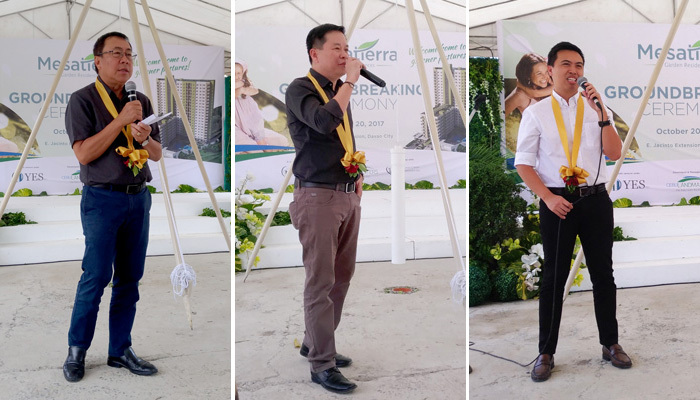 We vow to deliver this project in 36 months,” said Cebu Landmasters, Inc. CEO, Joe Soberano. (L-R) Jose R. Soberano III, President and CEO, Cebu Landmasters, Inc. 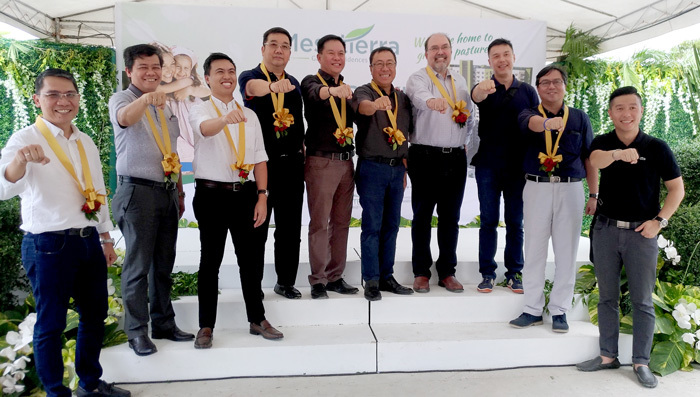 The men behind Mesatierra Garden Residences in their signature Digong pose. This is how your Mesatierra Studio Room would look like when furnished. Its 22.00 SQM with kitchen counter and sink, toilet and bath only upon turnover. Visit their showroom along Quirino Avenue, Davao City. 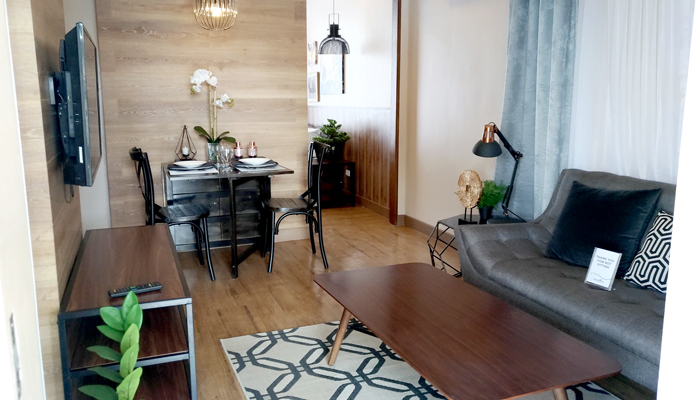 The 45.50 SQM 1 bedroom combined Unit. So elegant when furnished. Also with kitchen counter and sink, toilet and bath only upon turnover. Mesatierra Garden Residences is the 4th development in CLI’s garden series. This will soon rise at 22-storey tall with 694 well-designed units and 259 parking lots. 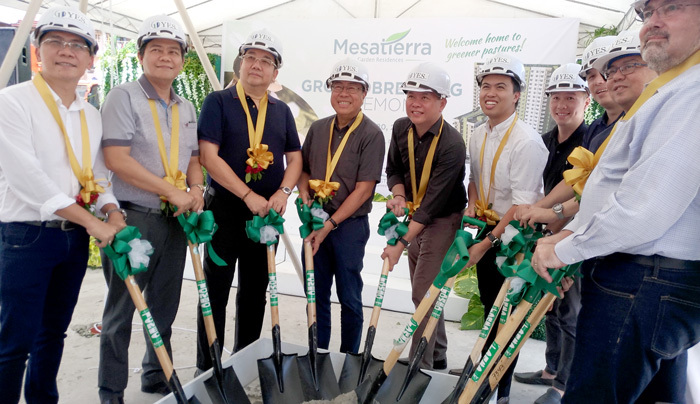 Unit owners of MesaTierra will enjoy garden-inspired amenities such as sky-garden, welcome pavilion, spa pool, veranda, jogging trails and landscaped areas. A fitness gym, prayer room, business centre, playground and swimming pool are also added as well-appointed amenities residents will enjoy. 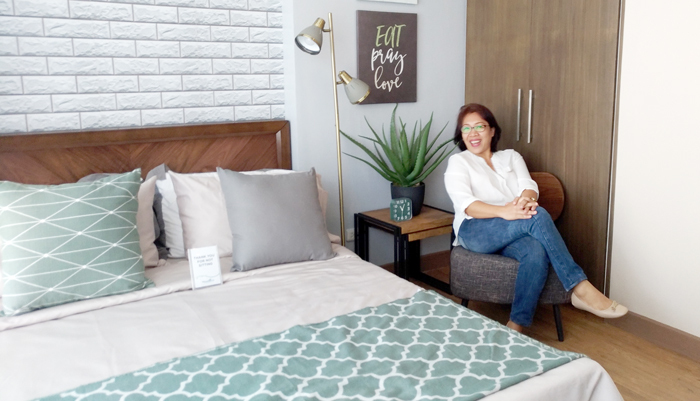 Mesatierra Garden Residences showroom is located at Edge Building (Former Kugot at Sutherland Compound) Quirino Ave., cor, Arellano St., Davao City, Philippines. Yuson Excellence Soberano, Inc. (YES, INC.) will also launch its second project later this year. A 2-hectare mixed-use development with condo-tel concept, hospital and high-end shops along McArthur Highway here in Davao City. Watch out for it!